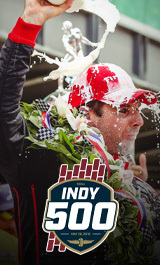 Continue the magic of the 103rd Running of the Indianapolis 500 during the annual Victory Celebration which will take place Monday, May 27, at the JW Marriott Indianapolis. During this annual event, special awards are presented, each driver in the field is recognized, and the winner of 'The Greatest Spectacle in Racing' is honored. Don’t miss this opportunity relive the emotion and pageantry of the world’s greatest race and the entire Month of May alongside the most talented drivers in the NTT IndyCar Series!